Two years ago Brian and I brought a store-bought piñata along to a weekend getaway with some friends. We filled it with adult-friendly goodies like alcohol nips (in plastic bottles), gift cards and travel-size beauty products, and then topped it off with some candy treats. It was a big hit—literally—so we decided to do it again when the same group of friends got together this past weekend. In addition to Memorial Day we were also celebrating a friend’s birthday. We knew we had to pull out all the stops and do something extra special so we made our own piñata. And it worked! Luckily it just took some time, imagination and a few papier mâché skills that we each picked up in elementary school. Click through the slideshow below to see how it all came together. 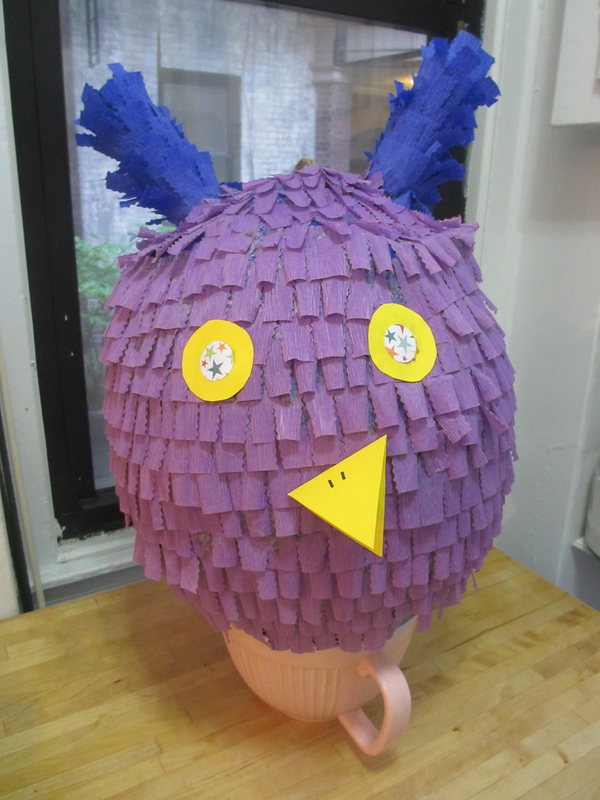 SWWU Tip 1: As you may notice, it’s a bit difficult to tell what our piñata resembles. Is it a monster, an odd wingless bird or something else entirely? We don’t know, and that’s the point. Since this was our first attempt at papier mâché in a few decades we decided to start off easy and make something unrecognizable. It’s still pretty cute, though—whatever it is! SWWU Tip 2: Want your piñata to last longer? The more coats of newspaper you use, the stronger it will be. We ended up with three coats on ours. Also avoid hitting it with a wooden bat or broomstick (especially if you’re a big, strong adult—remember, these things are designed for kids). A classic Wiffle Ball bat is perfect! SWWU Tip 3: Mix equal parts flour and water to form the perfect papier mâché paste. It should resemble pancake batter. Be sure to let your structure dry completely between coats. These treats have made an appearance in our kitchen twice in the past month. They debuted on New Year’s Eve and showed up again for a baby shower (what mama-to-be wouldn’t love these?). And, since they’re egg-free you’re safe to eat as many as your heart desires. The recipe is an adaptation of my basic chocolate chip cookie dough that I’ve been tweaking for the past few years. I hope you enjoy! 1. In a large bowl or in a stand mixer, cream the butter and sugars together. Mix for 3 to 4 minutes or until light and fluffy. Slowly add in the heavy cream and vanilla extract; mix until combined. 2. In a medium bowl, sift together the flour and salt. Slowly add to the butter mixture, combining as you go. Fold in the mini chocolate chips and the dark chocolate bar. Cover bowl tightly with plastic wrap and refrigerate for 30 minutes (or overnight). 3. Once chilled, roll the dough into ping-pong size balls. Insert a lollipop stick into the center of each ball and place on a baking sheet lined with parchment paper. Refrigerate for at least 30 minutes. 4. Meanwhile, bring a pot of water to a boil over medium. Top with a heatproof bowl, making sure the bottom of the bowl doesn’t touch the water, to create a double boiler. Add 1/3 of the chocolate chips to the bowl and allow to melt, stirring frequently. Once the chocolate is smooth, remove the chilled balls from the fridge. Dip or swirl them one-by-one into the chocolate, making sure to cover them entirely. Once coated in chocolate, gently shake off excess, and return to parchment lined baking sheet. 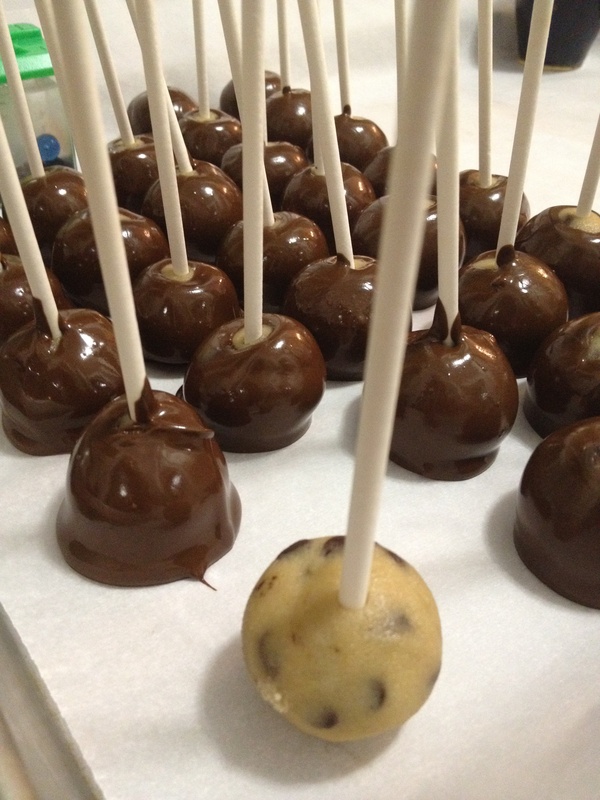 Repeat the process until all balls are coated, adding additional chocolate to the double boiler as needed. When complete, return the baking sheet to the refrigerator for about 1 hour or until chocolate is hard and set. Transfer to airtight containers and store in the fridge for up to 1 week. SWWU Tip: You can find lollipop sticks in your local craft or baking supply store and they’re also available on the Wilton website. I’ve used both 4-inch and 6-inch sticks, but find the longer ones are a bit easier to use when you’re dipping the dough into the melted chocolate. Would you want one in the mail? I hope so! My recent birthday will go down as one to remember. The weekend (yes, I said weekend) included several unexpected out-of-town guests, meals at my favorite restaurants and lots of good fun. The cherry on top ended up being a private after-hours party at a local ice cream shop where I got to create my own ice cream flavor then pedal a shiny red bike hooked up to a hand-churned ice cream machine to mix it. The night was so special and I knew my thank you notes had to be, too. I was able to quickly make the cards pictured above with a few goodies I had lying around the house. 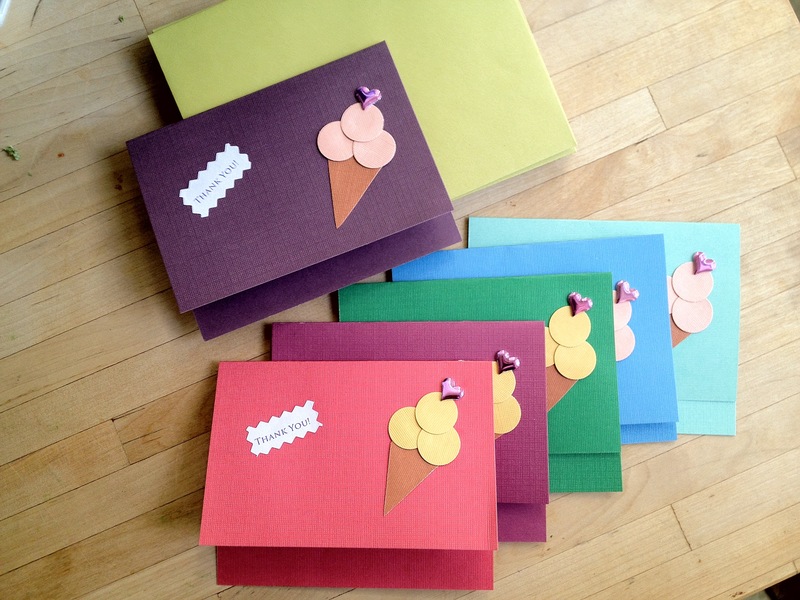 Take one piece of 4.5” x 5” cardstock and fold it in half to create each card. Select several complimentary colors of cardstock and cut out several circles with an oversized hole-punch. Use scissors to cut a cone shape from brown cardstock. Type the words “thank you” into your computer’s word processing program. Play around with the font and colors until you find one you like and print. Cut the printed text out with pinking shears. Glue the text, cone and three circles onto the front of the card. Finish with a heart sticker and mail in a colorful envelope. Hopefully, the friends who receive these notes in the mail will think they are as special and sweet as I thought the night was.